The perfect all around road rim (hard anodised). At 470 grams, this rim has proven to be light yet not sacrificing strength, stiffness, and stability. 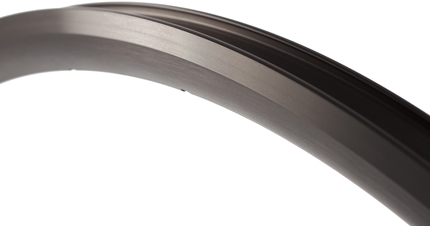 The well accepted 23mm wide profile mimics a tubular tyre in both comfort and ride quality. Please Note: Due to the separate anodising process on each spoke count version during manufacturing, there may be very slight differences in colour shade between the 20, 24, 28 and 32H versions. H Plus Son Archetype Hard Anodised Road Rim is rated 4.5 out of 5 by 11. Rated 5 out of 5 by Spica4 from The best aluminium alloy rim for this price. Best looking aluminium rim, good performance with normal rim brakes, also good for disc assambly. Rated 1 out of 5 by filanthrop from This excellent rim is flawed by colour mismatch If you consider buying a pair of Plus Son Archetype hard anodised rim in grey colour, beware of ordering 20h and 24h rim combination. If you do this at Wiggle, be prepared that you will get two rims of different look in terms of colour/hue. While the 20h version of the rim is greenish (olivish) grey in hue, the 24h version has a more neutral grey tone. The Wiggle will not recognize this colour mismatch as a flaw (saying that "The colour difference in the rims is a result of the anodizing method from the manufacturer") and you will end up returning the rims at your own expenses. Rated 5 out of 5 by Mattbl from Strong, good looking rims I made these up to be my 'go-to' wheels for road riding and racing. Whilst not featherweight they are light enough, stiff and were very true right out of the box. They easily went together to make a very stiff wheel, which has coped brilliantly with a season of riding and racing over the UK's dreadful roads. Matched with a 25mm tyre, these are great versatile rims. If you're using rim brakes the anodising soon wears from the brake track, but they still look good. I would like to know what is the difference between the hard anodised rims and the &quot;normal&quot; ones. Which break pads will avoid wearing of the black color? I heard Koolstop Salmon break pads will do the trick, can you confirm this? Hard anodising of aluminum is a term used to describe the production of anodic coatings with corrosion and abrasion resistance as their primary characteristic. This option should offer better wear resistance, corrosion resistance, and will reduce the rate at which brakes wear away the side of the rim. Hi Could you confirm the minimum tyre width that can be used with this rim please. Could I run 23mm or would it have to be 25mm? Hi, I run 23mils and 25s in winter. they are both fine. Colour - grey not black? Hi, Its hard to tell, are these grey opposed to the black colour that the original version comes in? Is it also available in black? Hi, they are dark grey with black decals. Black ones have white decals. Are the brake tracks on the Hard Anodised less likely to have the colour worn off ? I understand the 'normal' black Archetypes are also anodised but can suffer from the black paint wearing off the brake tracks. Does the same apply to 'hard anodised' or will these retain the paint on the brake tracks ? The hard anodised surface will be tougher than the standard version, but over time the finish will inevitably wear away from brake use. spokes for an Ultegra 6800 hub? Any idea what spokes I'd need to use this rim to replace the rim on an Ultegra 6800 rear hub, 20 hole? As this rim is the same depth (25mm) as the original Ultegra 6800 wheel, just use the spokes that came with the hub. I have just rebuilt 3 Dura Ace WH-7801 wheels using these rims and the spokes that came with the 7801 hub. perfect fit!! Has this rim a wear indicator. If so what type? Yes this rim does has a wear indicator. Will this rim take a 700 x 32 sized tyre? I'm considering pairing this combination with an XT hub for using with disc brakes. This tyre size should work for you. I can confirm that the ERD is 595mm, unfortunately the Inside diameter of the rims in question is not supplied by the manufacturer.